If you’re like me, you can solve a Rubik’s cube in about the time it takes a spaceship to reach the Andromeda galaxy. If you’re like Krish Shah-Nathwani though, you can do it in 1 minute, 41 seconds. He’s been cubing since 2014. He was a Bedford Middle School student, and spent days teaching himself with an online tutorial. Very quickly, Krish got hooked. His first competition came a few months later, at Yale. His time of 17.89 seconds — yes, you read that right — was not good enough to earn honors (you read that right too). But Krish had fun, made friends, and loved the cubing community. 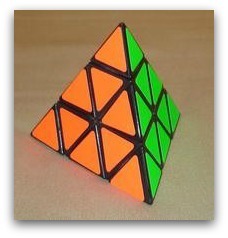 He began specializing in pyraminx (a tetrahedron puzzle with nearly a million different positions). Before year’s end, he placed 2nd at an MIT event. 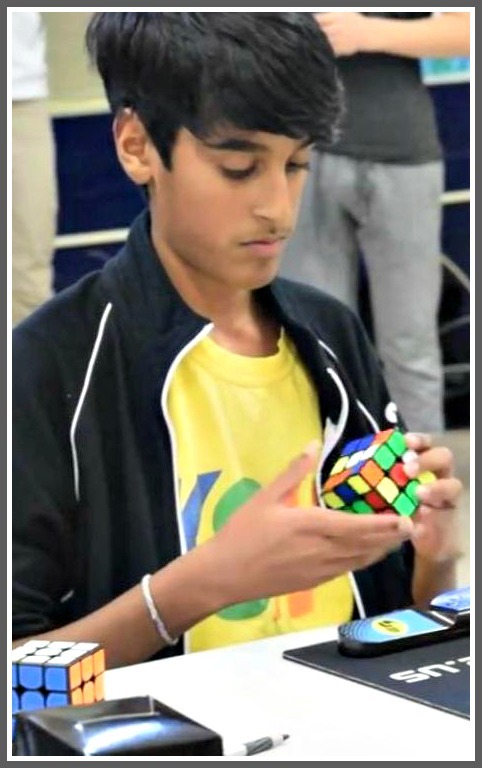 2015 brought Krish’s 1st sub-10 second solve; his 1st win, and a trip to the nationals in Portland, Oregon. Last year, he entered 13 competitions. Computers generate “scrambles.” Each cuber gets 5 different “solves.” The best and worst scores are discarded, because a lucky scramble can allow a contestant to skip a few steps. Scores are based on the average time of the middle 3 solves. Kirsh Shah-Nathwani intently works a cube. He also had his first blindfolded success. When the timer starts, cubers memorize what they see. He imagines a sequence of letters, then solves the cube using a mnemonic. So that 1:41 time? It includes the seconds he spent memorizing the cube. Last year, at nationals in Fort Wayne, Indiana, Krish reached 2 semifinals and 1 finals. He also does square 1 (shape-shifting) and megaminx (a dodecahedron). Is there anything Krish can’t do? A key characteristic of a good cuber is resilience, Krish says. You do not need “genius IQ,” or a mathematical mind. “Once you understand how a cube works, it’s simple,” he claims. As you may have figured, Krish is the real deal. He’s sponsored by Speed Cube Shop, an online seller of cubes, timers, lubricants, carrying bags, and anything else a competitive cuber could want. Krish gets his cubes for free (and displays their logo prominently). That’s a big help. Each cube turns differently, he explains. And each cuber has his particular style. A serious cuber needs lots of cubes. Krish puts them to good use. You can see them on his YouTube channel. He has over 1,500 subscribers. He’s so well known, in fact, that at competitions he gets asked for autographs and selfies. In March, Krish won his first competition, in Poughkeepsie, New York, with an average time of 8.36 seconds. He set a personal best time there too: 6.73 seconds. That got his name on the World Cube Association home page. This summer, Krish heads to Nationals in Salt Lake City, to compete against some of the best in the world. But, Krish insists, all this competition is not about beating others. “It’s cool to get accolades. But it’s more about competing against yourself. I’m ecstatic when I better myself. Speaking of practice: Krish spends 2 to 3 hours a day on his cubes. Every month or so, he sees those cubing friends in real life, at competitions. 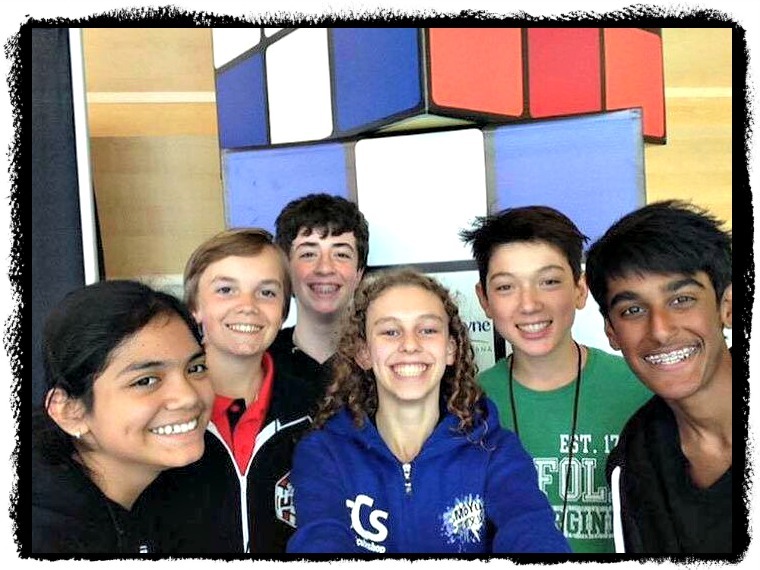 Krish and friends, at a cubing competition. His other friends — those at Staples — think his cubing is cool. Teachers are impressed too. The entire school saw see Krish in action recently, at the talent show. He was just as entertaining as the singers and dancers. Which leads to this important detail about Krish Shah-Nathwani: He has a life beyond cubing. A member of Staples Players, he has performed onstage in “Music Man,” “Newsies,” and the One-Act Play Festival. But he can’t resist one final plug for his greatest passion. 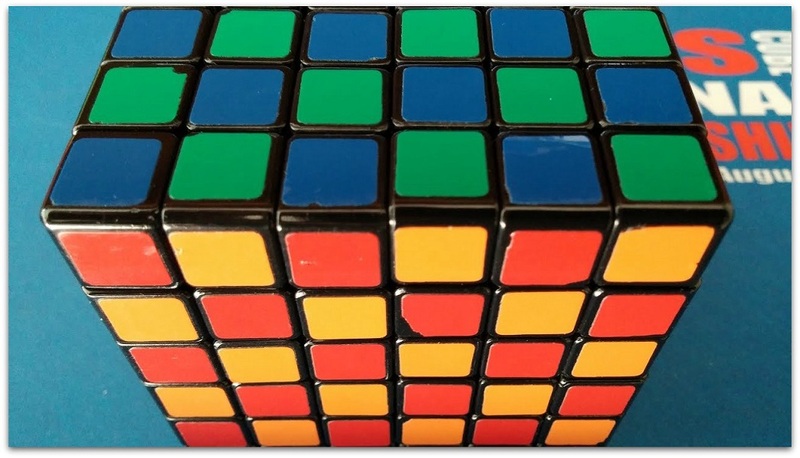 This entry was posted in Arts, Entertainment, Organizations, People, Staples HS, Teenagers and tagged cubing, Krish Shah-Nathwani, Rubik's Cube, World Cube Association. Bookmark the permalink. In addition to Krish’s talents, he’s a very pleasant and kind person; the Staples community is very fortunate to have him! Congratulations Krish! I would like to add that Krish also finds time to volunteer at the Westport Library. He has been one of the dedicated middle school volunteers who, even though they have moved up to high school, remain volunteering in the Children’s Library. His quiet modesty makes this article news to many of us who have worked with him for years. Wow Krish! Congratulations! A MA ZING & Cool!!! Brilliant! Loved reading this !! Best always! !